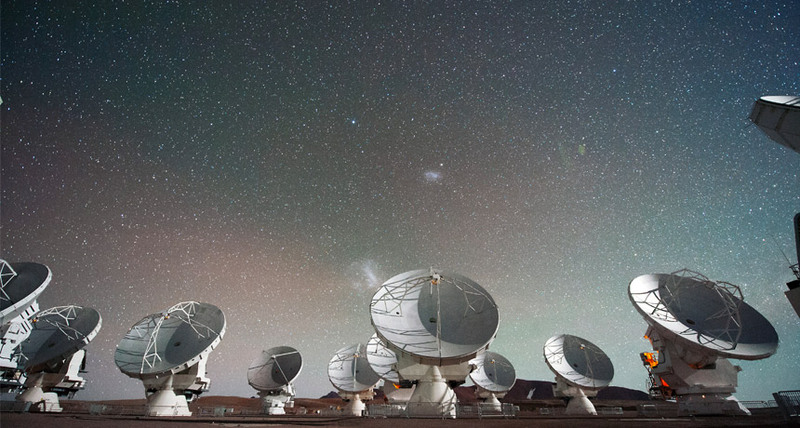 LONG AGO AND FAR AWAY Using the telescopes of the Atacama Large Millimeter/submillimeter Array in Chile (shown), astronomers discovered the most distant yet galaxy that appears to be filled with dark matter. A distant galaxy appears filled with dark matter. The outermost stars in the Cosmic Seagull, a galaxy 11.3 billion light-years away, race too fast to be propelled by the gravity of the galaxy's gas and stars alone. Instead, they move as if urged on by an invisible force, indicating the hidden presence of dark matter, astrophysicist Veronica Motta of the University of Valparaíso in Chile and her colleagues report August 8 at arXiv.org. "In our nearby universe, you see these halos of dark matter around galaxies like ours," Motta says. "So we should expect that in the past, that halo was there, too." Motta and her colleagues used radio telescopes at the Atacama Large Millimeter/submillimeter Array (ALMA) to measure the speed of gas across the Cosmic Seagull's disk, from the center out to about 9,800 light-years. They found that the galaxy's stars speed up as they get farther from the galaxy's center. That's a strange setup for most orbiting objects - when planets orbit a star, for instance, the most distant planets move slowest. But it can be explained if the galaxy's far reaches are dominated by dark matter that speeds things along. Similar measurements of the Milky Way and neighboring galaxies provided one of the first signs that dark matter may exist, although physicists are still trying to detect the proposed particle directly (SN: 2/4/17, p. 15). Her team's finding contrasts with a recent claim that such distant galaxies are oddly lacking in dark matter. That idea comes from a 2017 study by astronomer Reinhard Genzel of the Max Planck Institute for Extraterrestrial Physics in Garching, Germany, and his colleagues, who found more than 100 distant galaxies keep their slower stars at the edges and faster stars closer in - little to no dark matter required (SN: 4/15/17, p. 10).